Are you one of those guests who want to take home one of our delicious Holden House breakfasts? 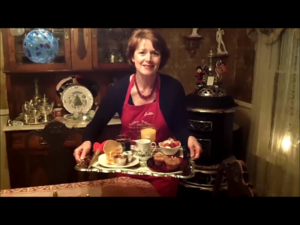 Well, now you can, by viewing Holden House 1902 Bed & Breakfast Inn’s Innkeeper Sallie Clark’s online “Inn the Kitchen” video demonstrating one of our easy signature dishes, perfect for the holiday season or anytime throughout the year. Our Southwestern Eggs Fiesta is an award-winning recipe featured on BnBFinder.com that has been featured in magazines and cookbooks. And Holden House continues to focus on elegant breakfasts with a homecooked flair. Enjoy watching just how to make this recipe right in your own kitchen. And, for those who would like to experience our delicious breakfasts prepared just for you, make a reservation to stay at our beautiful Victorian inn, located in Colorado Springs, Colorado and let us do the cooking! Directions: Well grease soufflé’ dishes with non-stick spray and break two eggs into each dish. Slice tortillas in half and place in dishes with flat edge down and outside eggs to form a U shape around outer edge of dish. Top with 1 oz. slice of cheddar cheese and ham, crumbled bacon or bacon bits & sprinkle with a dash of cilantro and spices as desired. Place foil around top of tortilla to prevent burning. Temp. and Time: Bake at 375 degrees for 30 minutes or until eggs are well done, cheese is melted and tortilla is slightly brown. Remove from ramekin and place on plate. Top with a dab of sour cream and tsp. of salsa/picante sauce. Sprinkle a dash of cilantro on top and serve on a plate. Garnish with additional parsley if desired. Number of Servings: Makes 12, but can easily be adapted for more. Have a delicious Holiday Season! This entry was posted in accommodations, bed and breakfast inn, christmas, Christmas specials, Holden House bed and breakfast, hotel, inn, recipe, sallie clark, travel, video, youtube and tagged bed and breakfast recipes, breakfast, brunch recipes, colorado springs, food, gourmet, holden house, Holden House Bed & Breakfast Inn, holiday baking, holiday cooking, Innkeeper Sallie Clark, recipe, www.bnbfinder.com, youtube video recipe by admin. Bookmark the permalink.